Our January Birthday bouquet has been inspired by the birthday stone garnet. Each is specially hand tied with a variety of colours reminiscent of the rainbow colours mined in the Garnet stone. 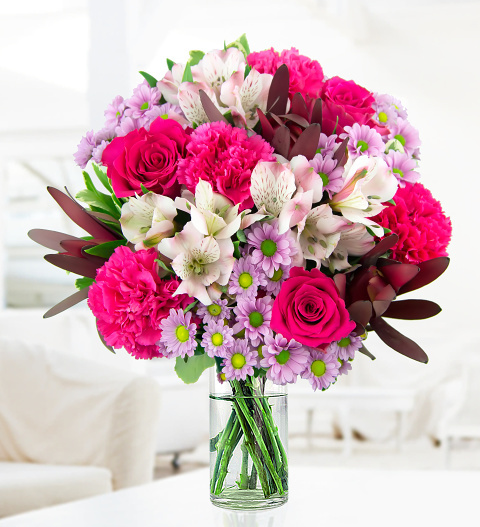 The January bouquet is ready to simply wow any recipient. Symbolizing friendship and trust, the bouquet is arranged with pink roses to represent the colour of Pyrope Garnet, chrysanthemums and alstroemeria with forest greens reflecting the green of tsavorite garnet. Perfect for all Birthday this January, this is one to be remembered. Choose the January bouquet to send a thoughtful bouquet.